It’s beginning to look a lot like Christmas on The Kenai, Alaska’s Playground! If the chilly days and heavy snowfall has you itching to get out of the house, don’t fret – we’ve got you covered! This epic list will keep you covered from outdoor adventures, to sweet indulgences, to scrumptious local restaurants, to fun community events and just about everything in between. No you won’t have a single excuse not to have a holly, jolly Christmas on The Kenai! 1 – Surround yourself with those that you love the most. 2 – Give to those in need and make your heart smile a little extra. 3 – Drive through some new neighborhoods and soak in all the sparkling Christmas lights. 4 – But first, stop by a local coffee shop for a caffeine and hot chocolate fix. Peppermint mochas anyone? 5 – Grab your special someone and enjoy a walk by the river while soaking in a magical winter, wonderland view. 6 – Find a sledding hill and let the kiddo’s burn off all that sugar from the candy, cookie and fudge overload. 7 – Go wildlife viewing and show your visitors just how epic your backyard truly is. 8 – Rent a hotel room for the night and enjoy some quiet time away from all the stresses of everyday life. 9 – Or take a weekend trip to a cozy B&B and enjoy a splendid change of scenery, without having to travel far. 10 – Take a snowy walk on the beach with your four legged companions. 11 – Get involved with festive community events and enjoy fun for the whole family. 12 – Cheat on your diet before the New Year rolls around! Visit some of The Kenai’s best bakeries and candy shops and indulge a little, won’tcha. Apple fritter anyone? We’ll take two! 13 – Got Christmas shopping to do? Shop local! Visit some of The Kenai’s most creative boutiques, seafood processors, automotive outfits and more. Support local businesses because it just feels good! 14 – Bundle up and enjoy a snowshoeing adventure into the peaceful backcountry. 15 – Or fuel your need for speed with a downhill skiing or snowboarding excursion at Alyeska Resort. 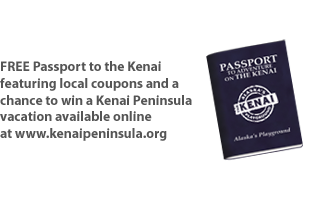 16 – Take a mini road trip and enjoy some of The Kenai’s most charming mountain towns that are straight out of a storybook. 17 – Go horseback riding, bring the kids to pet the horses or enjoy a one horse open sleigh ride that’ll transport you straight into winter wonderland. 18 – Or load up the sled and take the dogs for a long run on the snowy trails. 19 – It’s not Christmas on The Kenai until you’ve sat on Santa’s lap and met some of his elves! 20 – A white Christmas and a Northern Lights show? We should be so lucky! This is one that is definitely worth losing some sleep over! 21 – Head up to the Caribou Hills and enjoy a snow machining adventure with epic panoramic views. 22 – Visit your favorite local restaurants and ask for the ‘seasonal specialty’. Your taste buds just might get a major dose of flavorful nostalgia! PC: Yelp – Billy A. 23 – Unplugging is good for the soul! Rent a public use cabin in the Kenai National Wildlife Refuge and enjoy a night in the woods without any distractions. A hot fire and a yummy s’mores tastes better in the wintertime, we promise! 24 – Throw the drift boat in the water and enjoy wetting some frosty lines without all the summertime congestion. 25 – Or find a local lake, load up with Christmas yummies, pop the ice shanty up and enjoy a day of festive ice fishing. Wishing all of our friends, family and fans of The Kenai, Alaska’s Playground a safe and joyous holiday season! With our incredible lakes, rivers and ocean access, it’s pretty much a given that you’ll find countless places to access fish on The Kenai, Alaska’s Playground. Although you can go out and catch your own, there is just something extra special about eating mouthwateringly delicious seafood made to perfection by an passionate, creative chef. All of these spots throughout the Kenai Peninsula offer something uniquely different from the next, yet they all have one thing in common; a dedication to sourcing local seafood. From salmon, halibut, cod and rockfish to scallops, shrimp, oysters and king crab. If wild, natural, sustainable Alaska seafood is the name of your game, your options are truly limitless when you check out any of these great restaurants. For a finished product that is simply decadent, choose one of these excellent spots for your next date night out. Note: These restaurants are listed in no particular order, meaning… we love them all equally! 1: AJ’s Old Town Steakhouse & Tavern – Homer. Located on Bunnell, AJ’s is the place to go after a long day of playing outside in the ‘halibut fishing capital of the world’. The warm and cozy atmosphere mixed with the excellent food and outgoing service will make you want to come back time and time again. 2: The Duck Inn – Soldotna. Located off K-Beach road, this awesome restaurant offers a cozy and laid back atmosphere with great food that consistently delivers. The blackened salmon sandwich is a local favorite but we’re pretty certain that you’ll love just about anything you try. 3: The Chart Room at Land’s End Resort – Homer. Located at the end of the Homer Spit is one of the best restaurants in town, the Chart Room. Enjoy fresh Kachemak Bay Oysters, Alaskan Bouillabaisse or King Crab Legs with one of the most breathtaking views in all of Alaska. 4: Chinooks Restaurant – Seward. Located on 4th Avenue with an enchanting view overlooking the boat harbor, this restaurant offers fabulous daily specials, delicious drinks and some of the most tasty selection of wild Alaska seafood that we’ve ever experienced. We love the pan roasted halibut, smoked scallops, smoked scallop mac-n-cheese and the pecan crusted cod. YUM! 5: Inlet View Restaurant – Ninilchik. Located off the Sterling Highway, this cozy little spot is a great place to pull over and enjoy a delicious seafood dinner and a couple drinks while watching the sunset in the distance. We were especially fond of the service and warm atmosphere that was experienced here. 6: Mykel’s Restaurant – Soldotna. Located off the Kenai Spur Highway, this fantastic restaurant is a local favorite. With great service and a relaxing atmosphere, you’ll love dining on seafood favorites such as the walnut crusted salmon with raspberry beurre blanc, Kodiak scallops, garlic pan seared halibut and the tempura prawns. It’s all so mouthwateringly delicious! 7: Anchor River Inn & Restaurant – Anchor Point. Located off the Old Sterling Highway, this neat spot is a great place to fill up on delicious food after a long day of fishing for steelhead. You’ll love the Alaskan style décor and the wonderful service! 8: Christo’s Palace – Seward. Located on 4th Avenue, this lovely little spot is a great place to enjoy a date night out. You’ll love the grilled halibut Portobello, seafood sauté, smoked salmon fettuccine and the stuffed baked pasta. 9: The Restaurant at Porterhouse Grill – Sterling. Located off the Sterling Highway, this unassuming little spot is an excellent place to have a hearty seafood dinner after a day of fishing on the Kenai River. Try the colossal prawns, halibut or the surf n’ turf if you want to make your taste buds extra happy! 10: The Flats Bistro – Kenai. This relatively new restaurant located off of K-Beach Road has a spectacular view overlooking the beautiful flats and Cook Inlet. If incredible seafood is what you’re after, try the razor clams, scallops fettuccine, king crab legs, fish and chips or the salmon. Now that you’re likely wiping the drool up off your keyboard, be sure to keep these excellent places in mind the next time you plan on eating out. For more great options or recommendations, feel free to give us a call or drop us a message below and we will be happy to help in any way that we can!